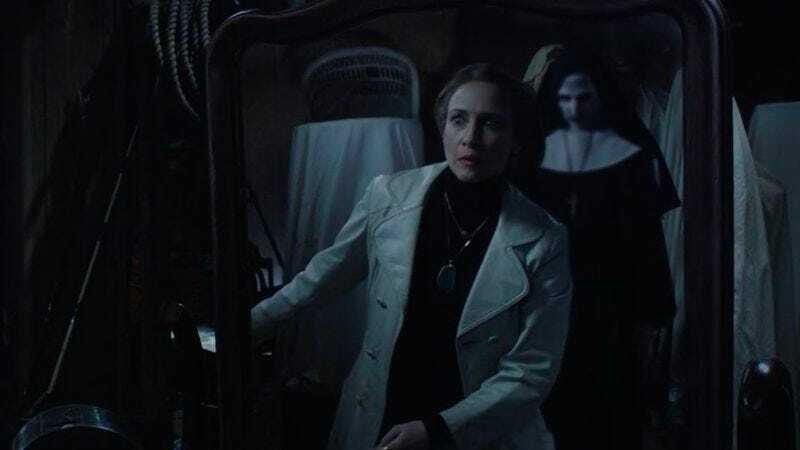 Way back in June, we reported that the demonic nun from James Wan’s The Conjuring 2 would be getting its own spin-off called The Nun, just like how the first Conjuring movie spawned Annabelle. Now, Deadline is reporting that Corin Hardy has signed on to direct the film, but we still don’t have any real details about the its plot. Unlike the Annabelle doll, the demonic nun’s whole story is pretty much told in The Conjuring 2, so there isn’t really a lot of prequel or sequel potential with the creature unless Hardy and the studio fudge the lore a little bit and come up with a new reason for this particular demon to disguise itself as a scary nun. As for Hardy, he’s apparently still attached to direct the Crow remake that Jason Momoa might star in, but it’s impossible to really know what’s going on with the Crow remake these days.